L-FRESH THE LION – ‘ONE’ SINGLE LAUNCH = | SOUL OF SYDNEY FEEL-GOOD FUNK SOUL DISCO vibes & beyond. 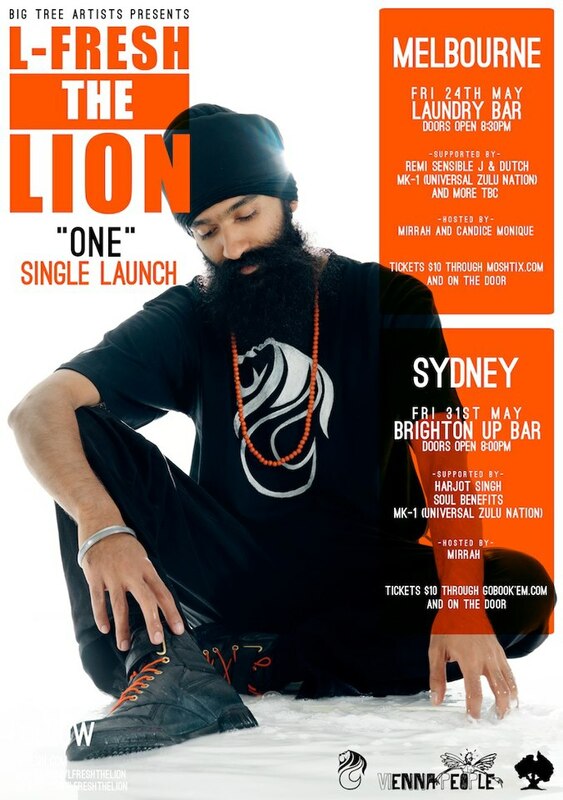 L-FRESH AKA The LION﻿ single launch on this Friday at Brighton Up Bar﻿ feat. our good friends MK-1﻿ (Universal Zulu Nation﻿) Mirrah Reflects﻿ Soul Benefits﻿ + more. The past few years have held great promise for Melbourne-via-Sydney MC L-FRESH The LION. Creating a name for himself with his versatile catalogue and uniquely engaging live show, L-FRESH has gone from strength to strength, nabbing high profile supports spots nationally (impressing the likes of NAS, Public Enemy, The Herd and many more) and churning out records that have hit home with a constantly growing fan base. Now, L-FRESH is preparing to release his debut single and album via Vienna People. ‘One’ is his powerful new single, and to celebrate, the man himself will be launching it with two very special shows in Melbourne and Sydney. Bringing along guests Soul Benefits and young MC Harjot Singh in Sydney, as well as Remi and the Kuan Yin Society in Melbourne, L-FRESH will be premiering the new song and some very special new material live for the first time. CHECK IT OUT AND BUY TICKETS ONLINE NOW!